ERRC News and information concerning what's going on in the club. Have information to share or want it posted, send it to elevatorriders@gmail.com and we'll get it posted. No commercial posts or advertisements are allowed. 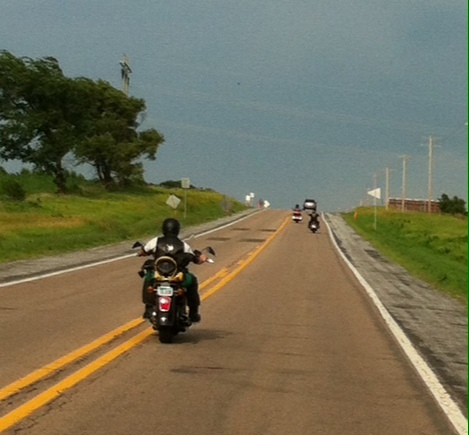 On August 17th, 2014 members of the ERRC attended the MNM RC Annual Benefit Ride in support of the “Tinley Wish”. 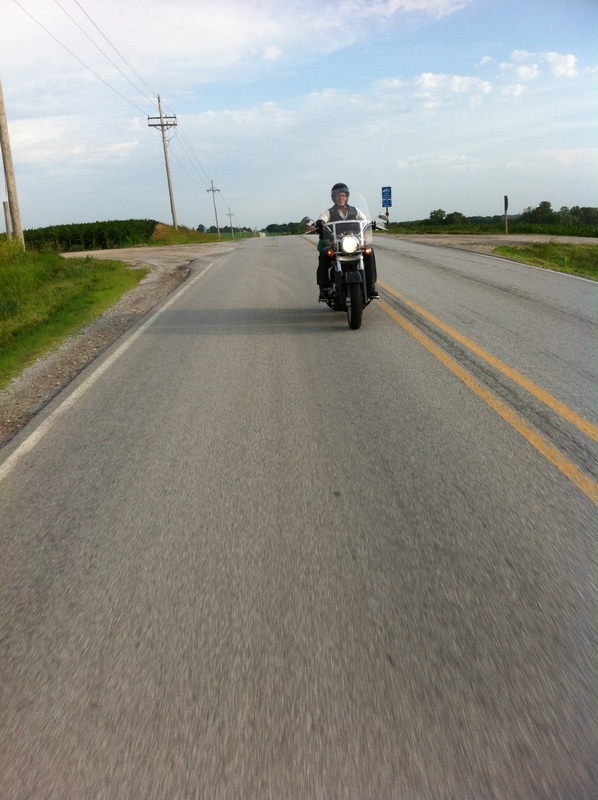 This is a memorial ride for fallen Illinois State Trooper James Sauter. Around 500 riders were in attendance and plenty of sunshine and fun was had by all. The Benefit Ride raised a considerable amount of money for the Tinley Wish program which helps children and families in need. They reported that they raised over $30,000 in the 2013 event. Very cool that the ERRC members participated in this event in support of a great cause! 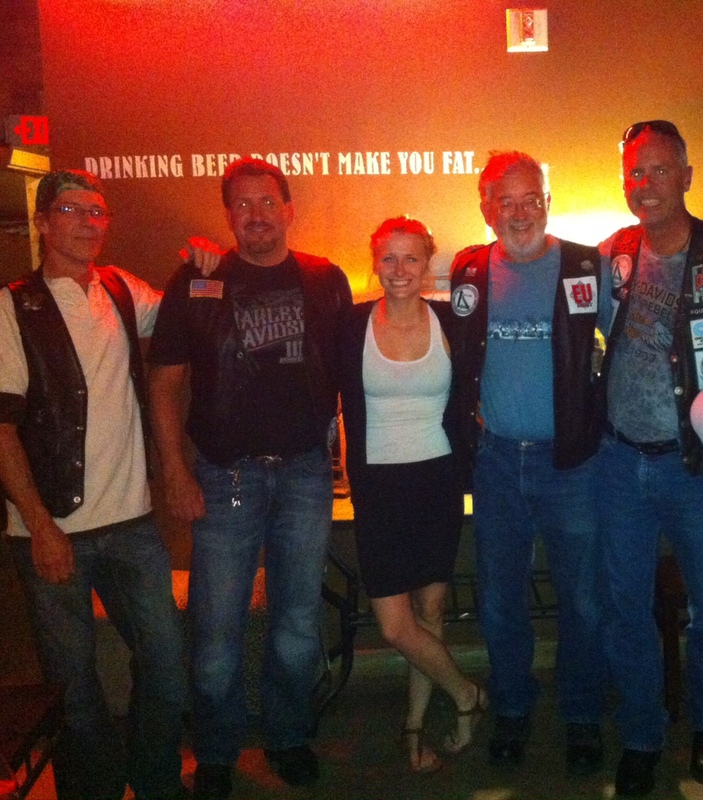 Illinois, Nebraska, and Iowa were to attend this first ever Elevator U Club ride. Unfortunately perfect weather, sunshine and blue skies were not on hand for our ride. Omaha, Nebraska . 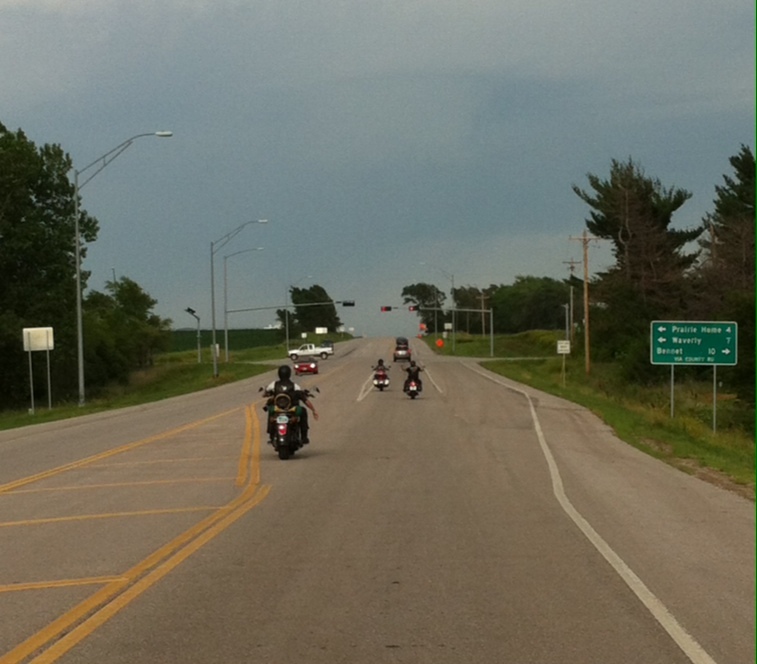 After donuts and coffee, and waiting out the rain storm, and then lunch, we were off riding west to Lincoln Nebraska . Frontier Harley-Davidson was our first stop. We needed to met up with another club brother stranded by the storm. We all took a tour of the dealership, and purchased a couple mementos. Lincoln girls. 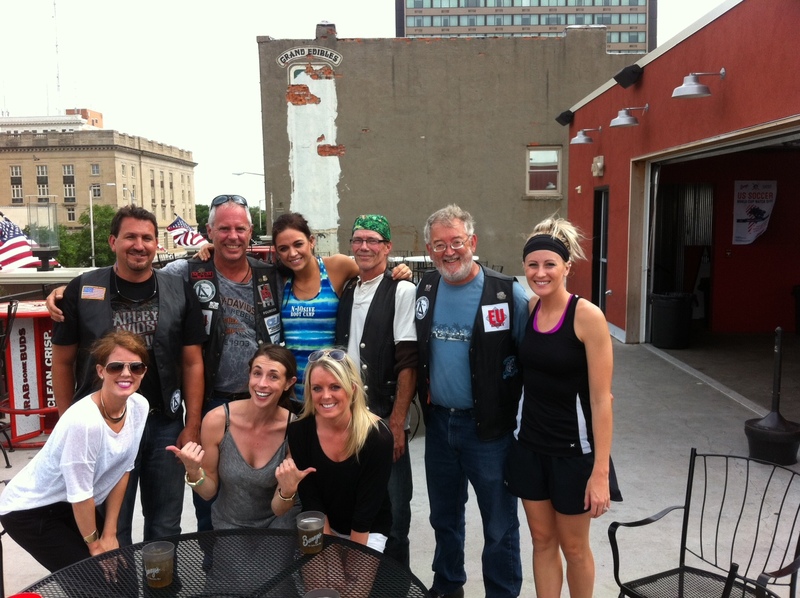 We all headed east to the One Eyed Dog Saloon, somewhere between Lincoln and Omaha . First order of business again, was to get to know the locals. Omaha with a brief stop at a friends new bar called Brick Street Tavern. We were again treated with some of the best local company. After our visit to our friends bar it was time to head in the direction of downtown Omaha . We went to Market Street and had a great dinner, which was needed after a long day on the road. Nebraska . We are all looking forward to our next Elevator Riders RC club members ride in San Antonio, Texas . 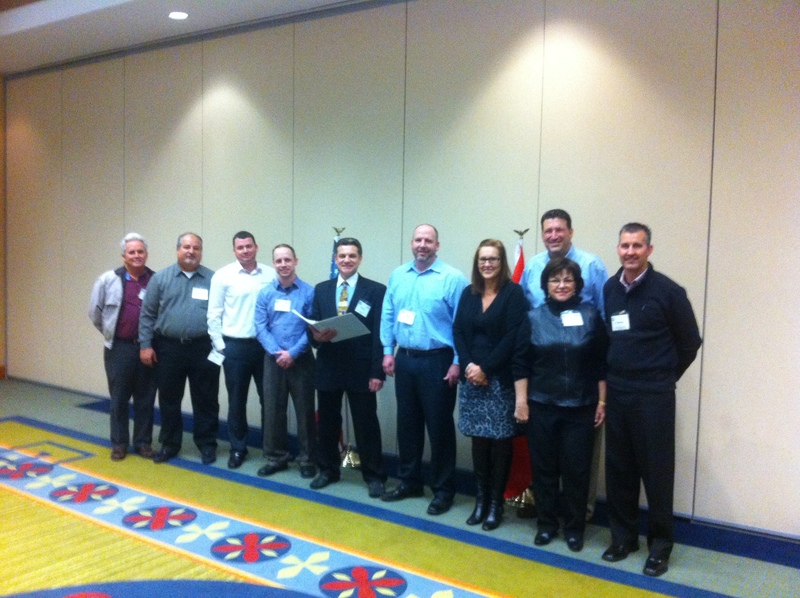 I attended the February Annual General Membership Meeting for the Elevator & Escalator Safety Foundation in Atlanta, Georgia. I arrived on Tuesday morning and the airline cancelled my flight back home on Thursday, when my plane reached the gate. Atlanta was bracing for a catastrophic winter storm. Two weeks ago they had a disaster on their hands with the last winter storm, and they would not be embarrassed this time. Northern Georgia was shutting down. The city became a ghost town. No cars on the streets or expressways. The Airport, Local Business, Government agencies all just closed when we arrived. Hotel employees were just staying at work in fear of the approaching winter storm. Unfortunately because of the storm the city had cancelled all schools in the district, and we were not able to witness the foundations Safe-T Rider program given to a local school. This year the Chairman of the foundation asked that I be the Chairman of the Nominating Committee for selection of new Board of Directors to the foundation. I attended with the nominees the New Board Member Orientation presentation given by the foundations Chairman John Koshak. A thorough overview of the foundations History, Board, Organization, Programs. Financial, and Fund raising were reviewed. I had the opportunity to attend the EESFc Board of Directors meeting which is our Canadian brothers, but only one director was able to make it into Atlanta and they had to cancel their meeting. The second day, believe it or not, we got to work attending to the foundations business at hand in the annual Board meeting. A thorough overview of the foundations Budgets, Financial, and Fund raising were reviewed. The last order of business for the foundation was the swearing in of the new Board members of the foundation. We have a great new group of directors and alternates, and I wish to thank them all for volunteering to be on the Board of Directors of the foundation. This years meeting will go down in history as the time Atlanta shut down, but didn't stop us from handling the Elevator & Escalator Safety Foundations business. Florida on Friday and Saturday September 27th and 28th 2013. 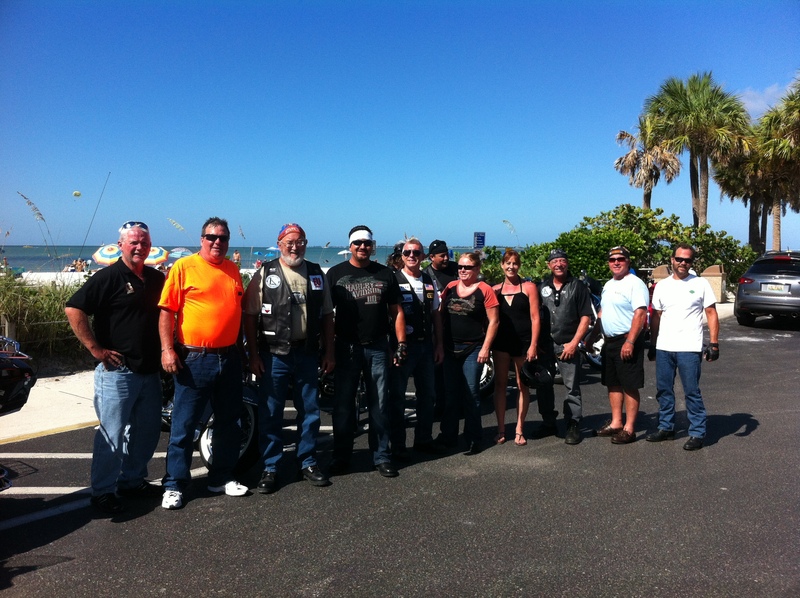 Club members from Illinois, Virginia, Nebraska, New York, Iowa, New Jersey, and Florida were to attend this years Club ride. Perfect weather, sunshine and blue sky’s for our ride was on hand. Tampa, Florida where the best door edge is manufactured for elevators. There were plenty of friends of the club that stopped by at the start to wish us a great time on the ride. After the factory tour, donuts and coffee, and all the pictures, and well wishes, we were off riding south down the coast line of Florida . St. Petersburg was our first stop. St. Pete was exactly what we pictured a Florida gulf shore town to be. We had some time to enjoy the famous bay bridge, beaches, and another picturesque town. 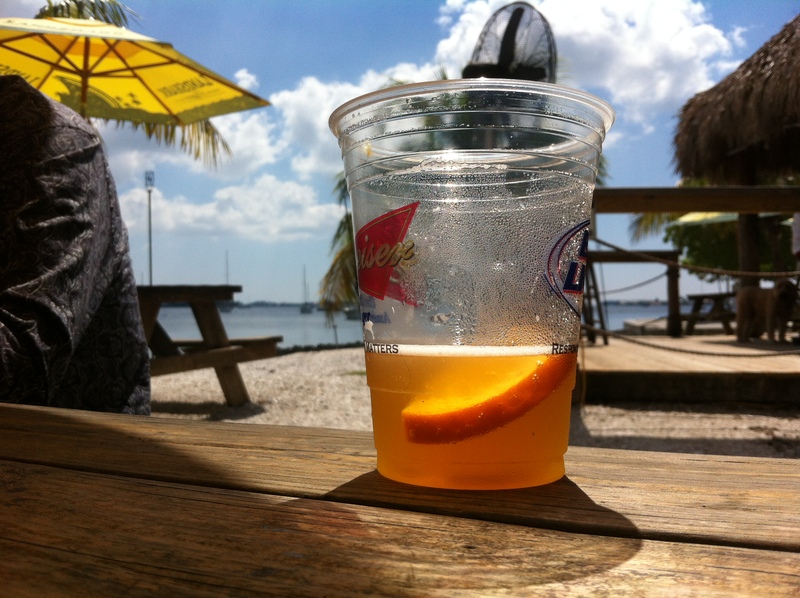 Our second stop included lunch at a island local restaurant down the Floridacoast line in Sarasota . Some very hungry bikers hit the Tiki Hut of this local island stop. We were all treated to Grouper and Mahi Mahi sandwiches for lunch. It was the perfect place to sample the fine local food. 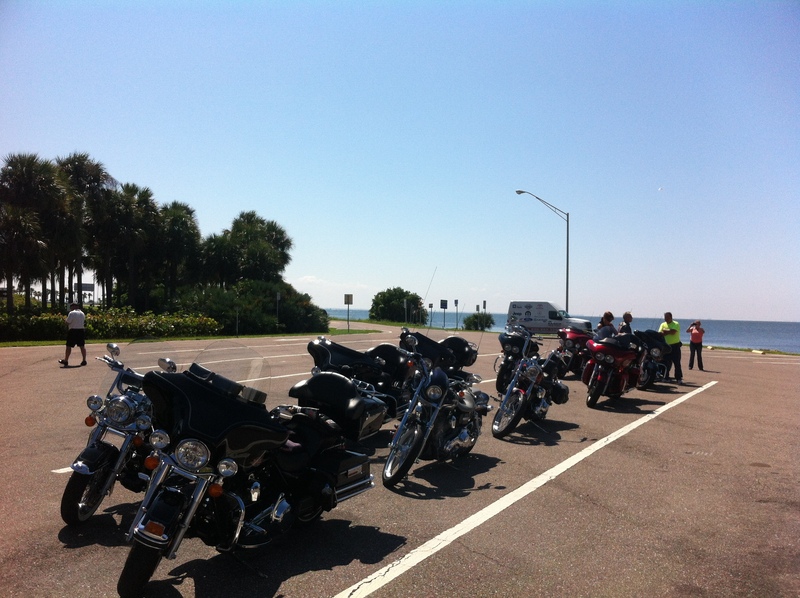 The ride down to Napleswas an amazing adventure touring the coast line from the islandof Clearwaterto Port Charlotte. Naples before the sun went down. First order of the night was we all got or favorite beverage ( Blue Moon on the Horizon ) and jumped into the Gulf of Mexico. That was a memory that will last a life time! The sunset was something that everyone will always think of when the sun goes down now. ( aka the Green Flash ) We all cleaned up and had dinner at the resort. Some of the finest fresh sea food was enjoyed by all which put us all down for the night. Tampa . Our tour started back hugging the Floridacoast line from Naplesto Venice . We were treated again to some of the most picturesque coastal islands, bridges, and beaches. Our lunch stop was to be in Venice at a local favorite on the beach. We were not disappointed. The atmosphere on the beach, and the sea food was awesome. 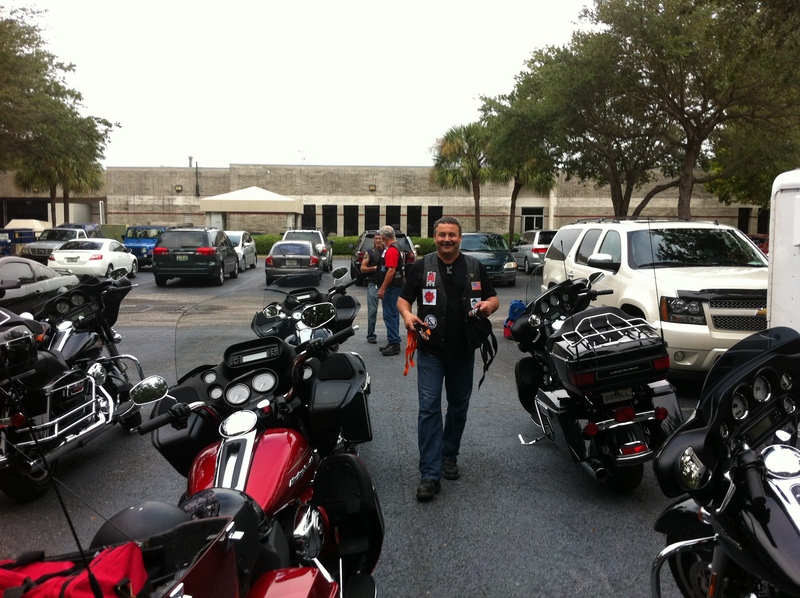 We had some time to again enjoy the company of our fellow riders, and another picturesque Florida town. We all hopped on our bikes and rode north up the coast just south of Siesta Key. 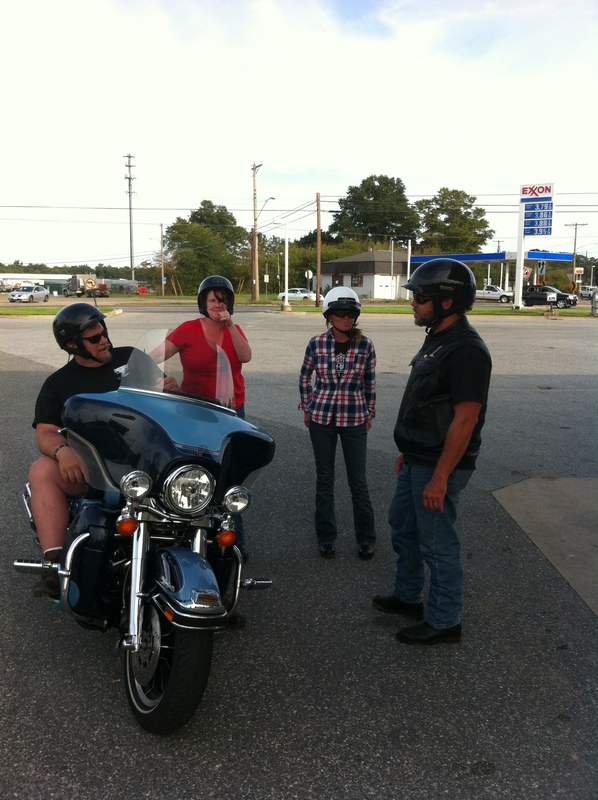 We all stopped for gas and a brief rest before we made our turn and headed north towards I75 and Tampa . From there we had an unbelievable highway bridge ride over the Bay, and a straight route to the finish, at the Tri-Tronics factory in Tampa . Florida . Tampa is a nice place to spend some time visiting with friends. Florida . We all look forward to next years Elevator Riders RC club members ride in San Antonio, Texas . 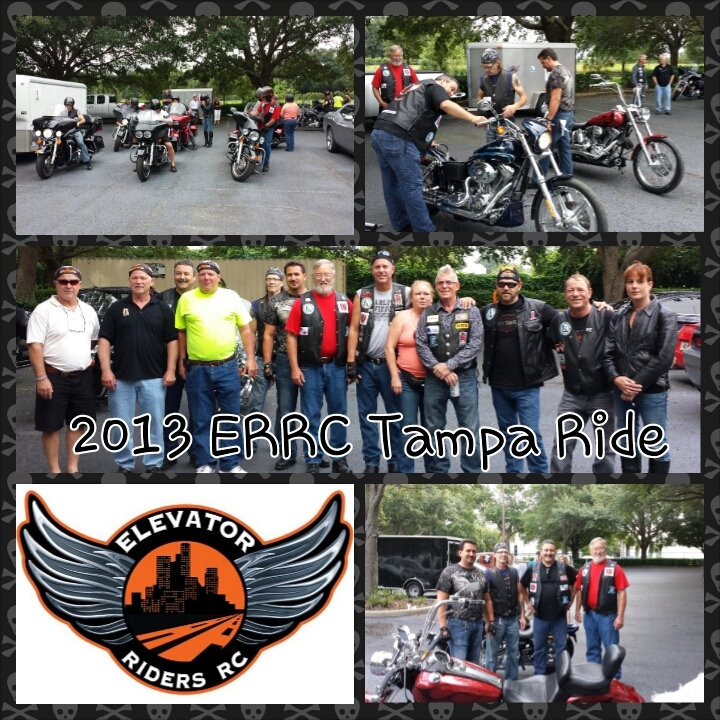 Tampa, FL - On September 25th & 26th, Elevator Riders RC again joined forces in support of the Elevator & Escalator Safety Foundation (EESF) with its 50/50 Poker Run. 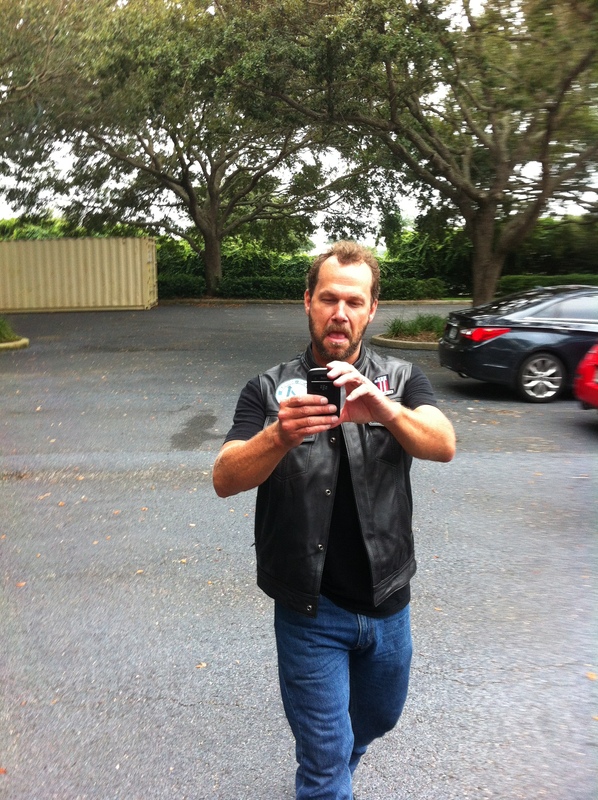 The third Annual Poker Run was a success as we had a total of 40 hands played, and many extra playing cards taken. 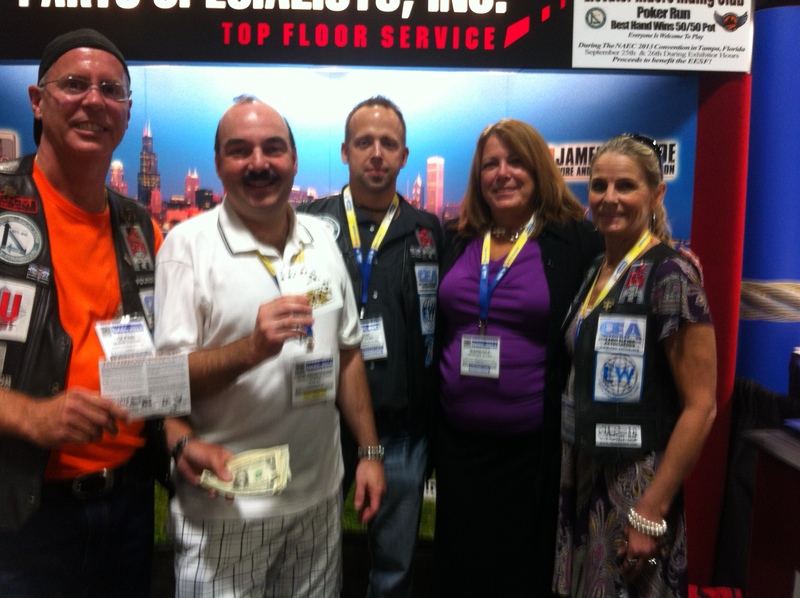 The winning hand was a full house Queens over Sevens by Nick Montesano of Merrick, NY. 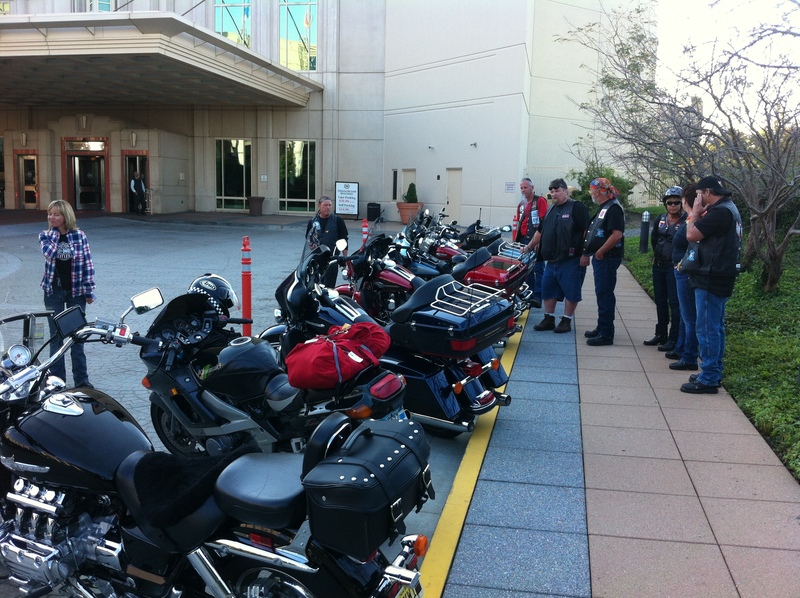 We wish to Thank all the participates of this years charity poker run event. Without you we would have not been able to raise over $473.00 dollars for the foundation, and that will educate over 1,650 children on the safe way to ride elevators and escalators. Elevator Riders RC Supports "Tinley Wish"
On August 18th, 2013 members of the ERRC attended the MNM RC Annual Poker Run in support of the "Tinley Wish". Around 750 riders were in attendance and fun was had by all. The Poker Run raised a considerable amount of money for the Tinley Wish program which helps children and families in need. Very cool that the ERRC members participated in this event in support of a great cause! Gary Schreiber of Chicago, Illinois passed away on August 9th at the age of 55. Gary began his 34-year career in 1979 at C.J. Anderson & Company. He began his empoyment with Parts Specialists, Inc. in 2010. He was a past President of the Chicago Elevator Association (CEA), member of the Elevator Riders Riding Club, Journalist of the CEA News Crew, and a member of the CEA Golf Outing Committe. Gary is survived by his wife Patsy, two Daughters, Megan and Bridgette. His friendship will be greatly missed. Hello Elevator Industry and Friends! 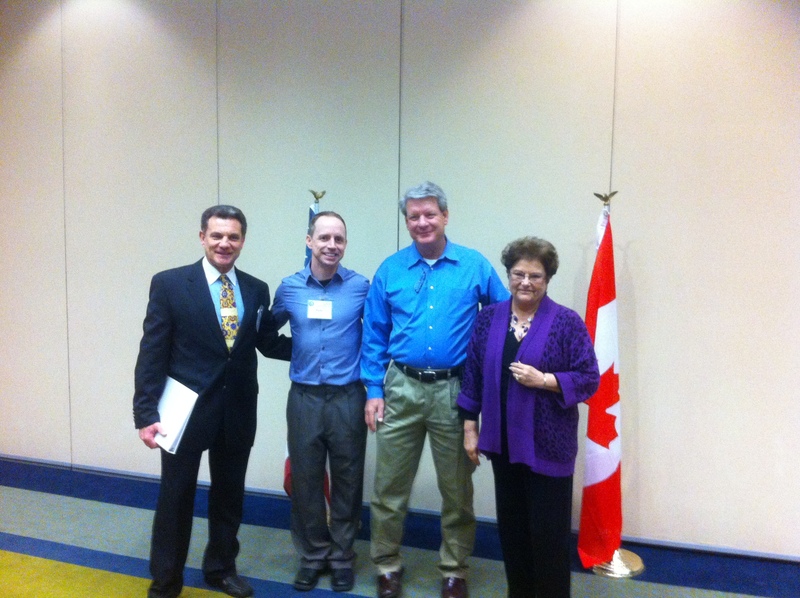 I attended the February Annual General Meeting for the Elevator & Escalator Safety Foundation in Atlanta, Georgia. I attended the New Board Member Orientation presentation given by the foundations Vice Chairman John Koshak. A thorough overview of the foundations History, Board, Organization, Programs, Financial, and Fund raising were reviewed. We were able to witness the foundations Safe-T Rider program. This is the program that the foundation uses to educate over 500,000 children in the USA, and over 40,000 in Canada on the safe and proper use of elevators, escalators, and moving walks. 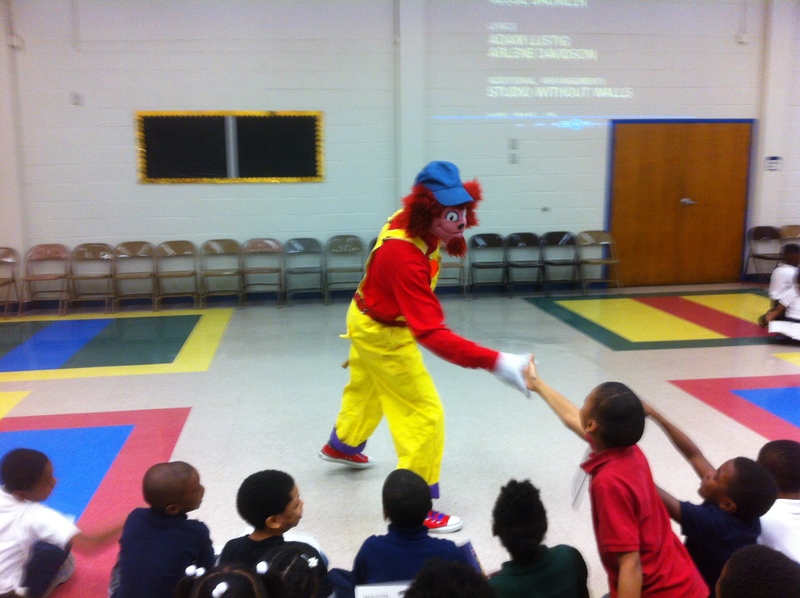 The program was presented at the Charles L. Gideons Elementary school in Atlanta Georgia to it's 2nd grade students. The presenters of the program were the Chairman of the foundation Robert Merlo Jr., and as Safe-T (the Cat programs character) the club's own Steve Romnes. I had the opportunity to attend the EESFc Board of Directors meeting which is our Canadian brothers. They also thoroughly reviewed the Budgets, Financial,and Fund raising of their foundation. 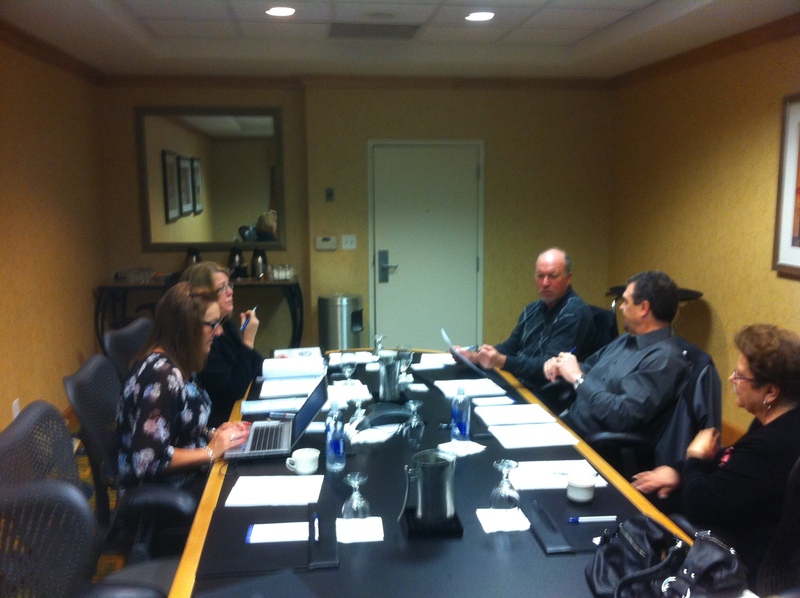 The secound day we got to work attending to the foundations business at hand in the annual Board meeting. A thorough overview of the foundations Bugets, Financial, and Fund raising were reviewed. The last order of business of the foundation was the swearing in of the new Board members of the foundation. The new executive officers are Chairman John Koshak, Vice Chairman Tom Sybert, Treasurer Gary Saxon, and Secretary Ricia Hendrick. The Elevator Riders Riding Club Patch order form is now online. To Order please click this link and you will be linked to a page that you'll need to enter your email address and the anti spam code before it will open. Sorry but this is the only way to keep those nasty spam bots out. Note that we will confirm with you the quantity of patches you are interested as well as your credit card information over the phone so there's no need to place it anywhere on this form. Also the purchase of these patches is open to members and non members of the ERRC. So whether you want to dress up your riding vest or jacket or your work jacket we've got the patches to do so. All supporters patches are $25.00 each. If you are interested in having your own patch made and added to our supporters list please contact us at elevatorriders@gmail.com. 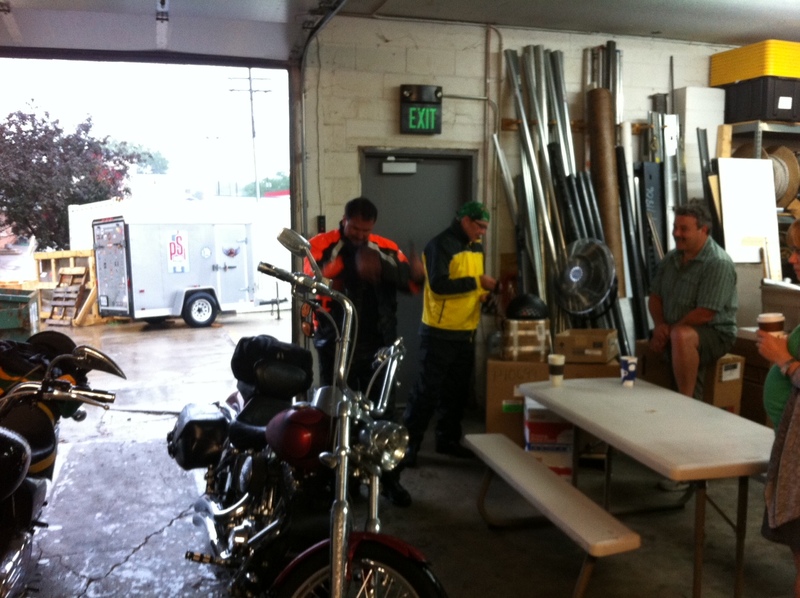 The Elevator Riders RC members and guests, rolled thru New Jersey on Friday September 14th 2012. 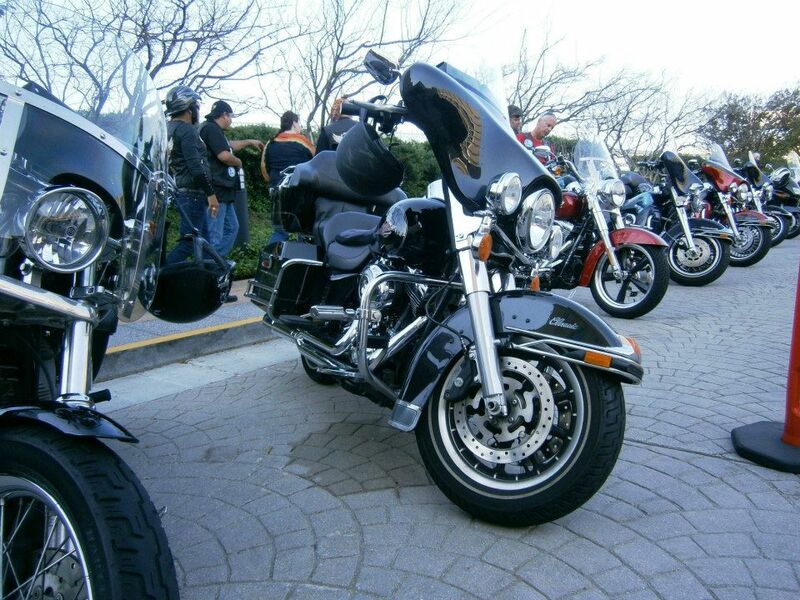 Club members from Illinois, Virginia, Nebraska, New York, Massachusetts, and New Jersey were to attend this first ever Club ride. Perfect weather, sunshine and blue sky's for our entire days ride were on hand. Our tour started at the Atlantic City Convention Center, where for the last four days we all experienced the greatest elevator show on earth. There were plenty of friends of the club that stopped by at the start to wish us a great time on the ride. After all the pictures, and well wishes, we were off riding down the coast line of New Jersey. Cape May was our first stop. Teeming with visitors, Cape May was exactly what we pictured a New Jersey sea shore town to be. We had some time to enjoy the Cape May point, lighthouse, beach, and another picturesque town. Our second stop included lunch at a small local restaurant halfway up the Delaware Bay near Bridgeton, NJ. Some very hungry bikers hit the front door of this local stop. We were all treated to crab sandwiches and clam chowder for lunch. It was the perfect place to sample the fine local food. After our crab lunch we had some time to enjoy the company of our fellow riders, and another picturesque New Jersey town. We all hopped on our bikes and rode north up the Delaware River just south of Philadelphia, PA. We all stopped for gas and and brief rest before we made our turn and headed east towards Malaga, NJ. This area of New Jersey had to be where the Jersey cow got its name. From there we had a straight shot down route 40 to the finish, at the Atlantic City Convention Center. Friday was a full day, and when we all come back, we will definitely tour more of the scenic byways of New Jersey. Atlantic City is understandably an adult playground, and a nice place to spend a weekend with friends. The club's ride thru New Jersey was an exciting and fun adventure. We all made friendships that will last a lifetime. 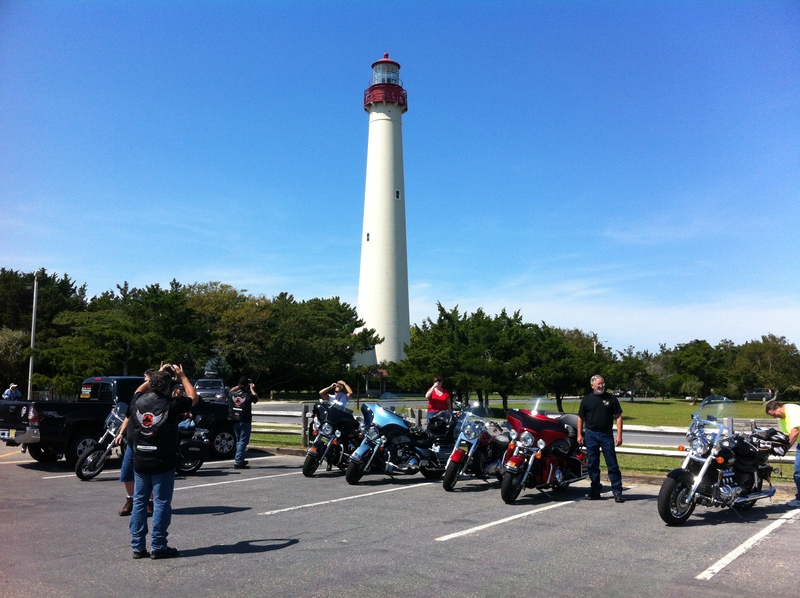 Special Thanks to Ride Captain PJ and the other club members for the well organized and beautiful tour of New Jersey. We all look forward to next years Elevator Riders RC club members ride in Tampa, Florida.